LIB X …LOST Introduces the SHORT ROUND High Performance Hybrid Model! …Lost/Mayhem’s legendary Matt Biolos shapes world class high performance surfboards. Mike Olson’s Lib Tech Eco Iso construction is unrivaled in terms of performance, durability and revolutionary environmental niceness. The Lib X …Lost partnership results in surfboard performance and value that cannot be matched. We are thrilled to present the second in a series of Lib X …Lost surfboard collaborations: The Short Round high performance hybrid, perfectly complimenting our first offering, the easy and speedy Puddle Jumper. performance shortboard. The speed comes from a low entry rocker and wide-ish nose, with a forward wide point and generous concave throughout. 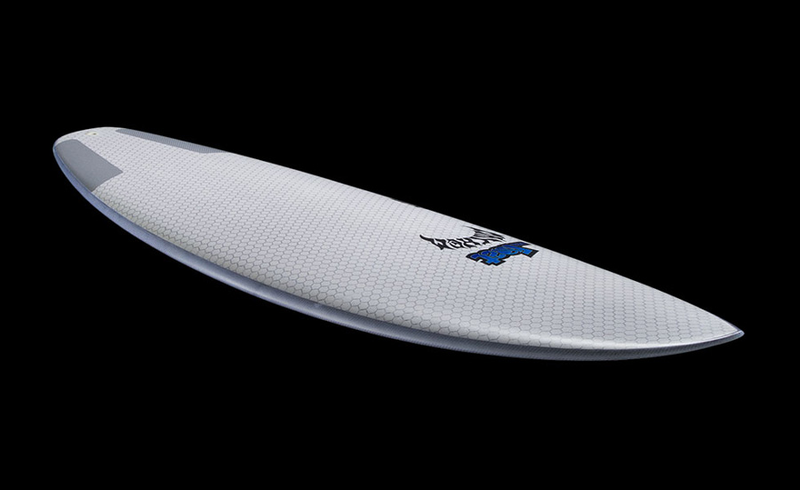 The performance comes from a moderate, but not flipped up, tail rocker, a double concave through the fins and the same sort of modern bump squash tail you would find on a typical contest style, small wave HP shortboard. All combined, it doesn’t look like anything fancy and there are no gimmicks, but sometimes less is more, and there’s a lot packed into this little surfboard. Sizes: 5’4”, 5’6”, 5’8”, 5’10”, 6’0” – Available now! Thirty years in the making Lib Techs ECO ISO construction pushes performance, durability, environmental materials and process to new levels. At the heart of the board is Nitrogencell foam that is loaded with nitrogen and has engineered elongated cell structure for maximum compression strength and energy return. Nitrogen cell will not absorb water and is 25% -40% recycled material and we recycle 100% of the offcuts into new foam. Hexzylon Fiberfoam surface skin greatly enhances ding resistance and break strength while adding a silky smooth ride. Basalt fiber chosen for its high strength properties and vibration absorption is placed directly beneath the Hexzylon adding strength and performance. All this is fused using a unique resin matrix that bridges the gap between polyester and epoxy…the best qualities of a new polyester with the lifespan of an epoxy. All Lib Techs come with our Freedom of Choice FOC 5/8” for and aft adjustable fin system; the lightest and toughest fin box system on the market. Fits many two tab systems and some solid base fin brands. Every Lib Tech is hand built by surfers in the USA near Canada at Mervin Manufacturing. Mervin Manufacturing is the leading designer and manufacturer of snowboarding, surfing, skiing and skateboarding products. Built at the world’s most environMENTAL zero hazardous waste producing factory by the people who ride them. Mervin Manufacturing was founded by snow/skate/surf enthusiasts Mike Olson and Pete Saari in 1977. In an industry where virtually every other company has moved production to China or offshore, Mervin is the longest running and last major board factory in the USA. Based out of Sequim, Washington, on the Strait of Juan De Fuca between the rugged Olympic and Cascade Mountain Ranges, Mervin is a direct link between riding and manufacturing.